Review: If you have the time to sit through an entire album V: Havitetty would be a superb choice. The album features two tracks, one goes just over 30 minutes and the other just breaks 26. The long song lengths might turn some off but as other albums have proved in the past (Dopesmoker, Crimson) sometimes enduring the length of something pays off majorly. When taking into account the lengths of the songs you might think to yourself "this is going to put me to sleep" in this records case you would be dead wrong. Moonsorrow created something that even a person with the attention span of a rodent could most likely sit and enjoy. The songs flow perfectly, the build ups are amazing and the climaxes are equipped to put your ears in permanent nirvana. The band refuses to ditch atmosphere for a cheap thrill and struts onward in order to make this a piece of art that sears into the listeners brain. The band took on a darker tone with this release and the folk elements embrace this decision and make it something truly special. If anything mentioned above sounds appealing to you listening to this would be a great idea. 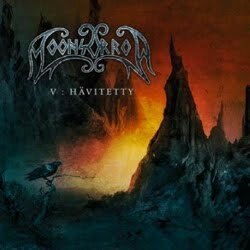 With this release Moonsorrow didn't just stretch an idea and milk it for all it was worth, they took it and made it the length that was necessary and delivered a classic when all was said and done. For fans of this style V: Havitetty is absolutely essential.